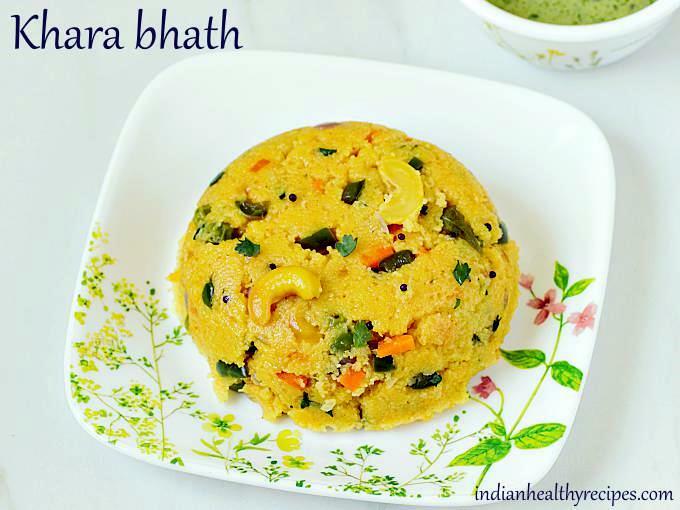 Khara bath or rava bath is a breakfast from Karnataka made with semolina, mix veggies and spices. 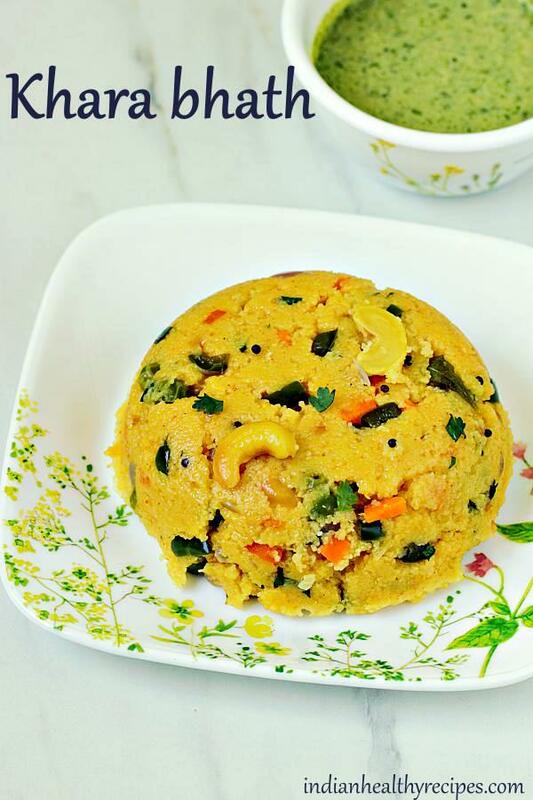 It is a variation of the most popular Rava upma. 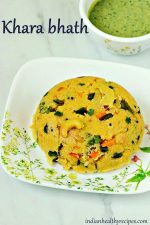 Khara bath is commonly seen on the menus of Karnataka Tiffin Centers & Restaurants. Most people love this for the subtle flavor that comes from the spice powder used. Khara bath tastes good on its own. But it is usually served with coriander Coconut chutney. The key to making a good khara bath lies in the spice powder used. Rava bath served in each tiffin center has a distinct flavor & taste as each one uses their own unique masala powder. 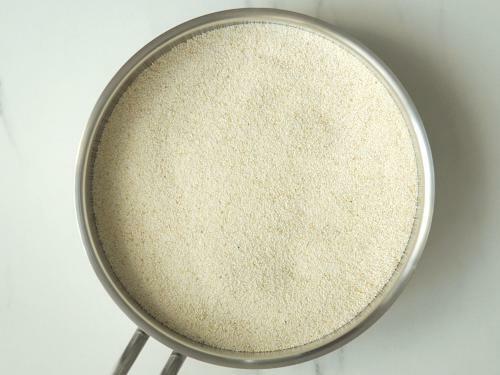 To make khara bath I have used homemade vangi bath powder that I shared on my Vangi bath post. However you can use any other spice powder like bisi bele bath powder or sambar powder. I make this sometimes for dinner as it doesn’t take much time to prepare. It is filling as a good amount of veggies are used. Roast the rava well on a low to medium flame until it turns crunchy and light. The unique aroma of the khara bath comes from the spice powder so use a good flavorful one. 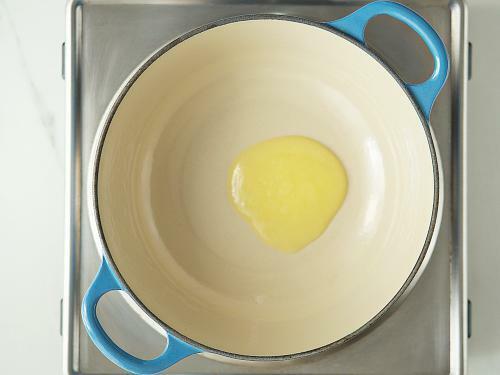 Do not reduce the quantity of ghee than mentioned in the recipe as it helps to get a non sticky rava bath with a soft melt-in-the-mouth texture. 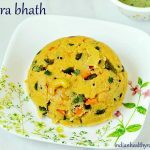 Khara bath is a breakfast dish from Karnataka & is mostly served in Tiffin centers and restaurants. Dry roast rava on a low to medium flame stirring often until crunchy and light. Do not brown the rava as it changes the flavor of the khara bath. Keep this aside. 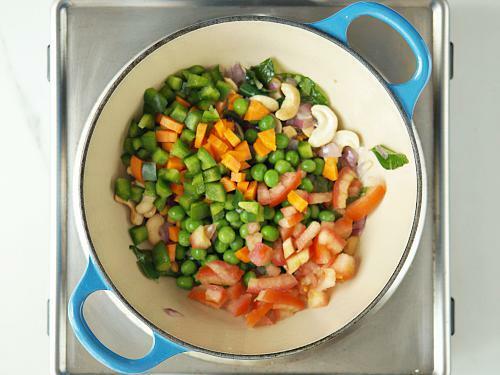 Wash and chop all the veggies and set side. 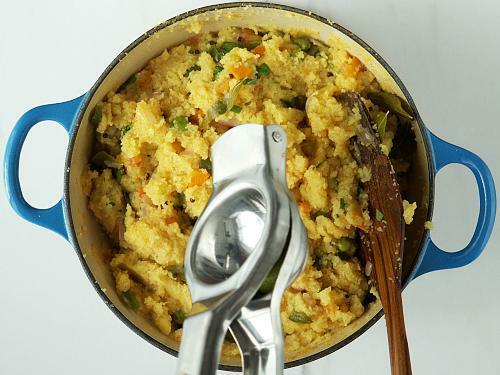 Heat 1½ tbsp ghee in a pan. 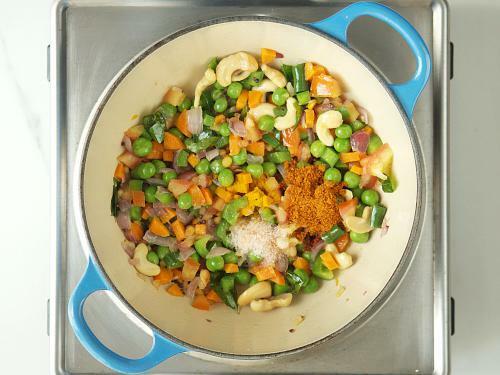 When the ghee turns hot, pop the mustard seeds first and then add the dal and cashews. Fry until the dal turns golden. Then add the curry leaves, ginger & hing. Add onions and fry until transparent. Next add in all the veggies and stir fry for 2 mins. Cover and cook until slightly tender. Add in the vangi bath powder, turmeric and salt. Pour water and mix. Check salt and add more if needed. When the water begins to boil, Set the flame to medium or low. Pour the rava in a stream with your left hand and keep stirring it in the water with your other hand. Quickly stir and break if any lumps. 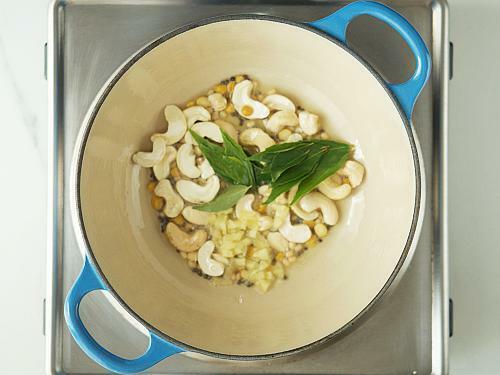 Cover and simmer until the water is absorbed completely. Turn off and allow to rest for 5 mins. Add in coriander leaves & half tbsp ghee to the hot khara bath. If desired you can sprinkle 2 tbsps grated coconut and lemon juice. Serve khara bath hot with coconut chutney. 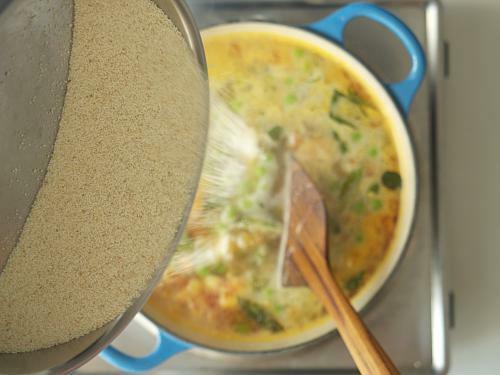 1.Skip this step if you are using double roasted semolina. 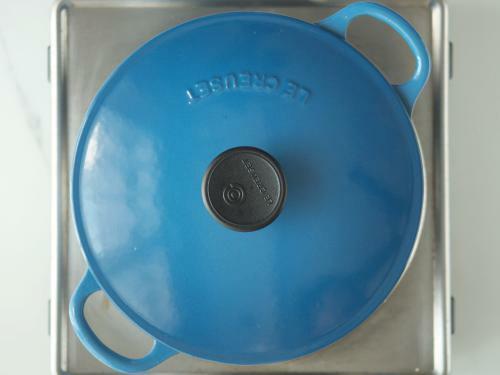 Add rava to a pan and dry roast it on a low to medium flame. Keep stirring to roast evenly. Do not brown the rava as it changes the flavor of khara bath. Keep this aside to cool. 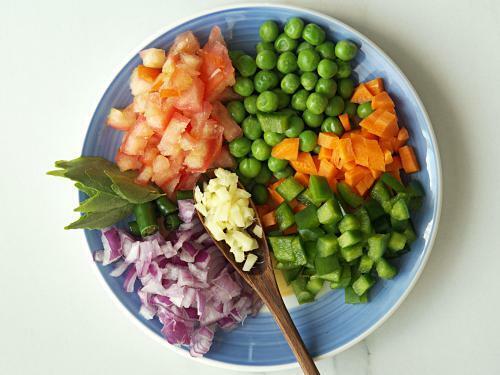 2.Chop finely onions, tomatoes, chilies, beans, carrot and capsicum. Mince or grate the ginger. Rinse peas and curry leaves as well. 4.Add mustard to the hot ghee. 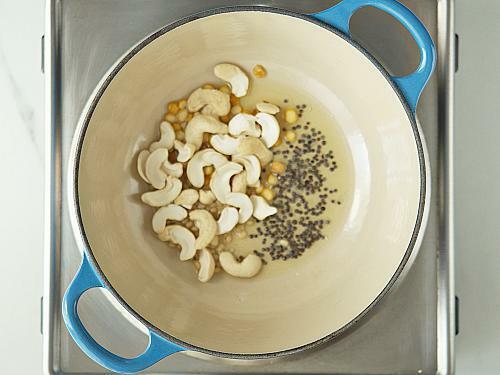 When they begin to pop, add dal and cashews. 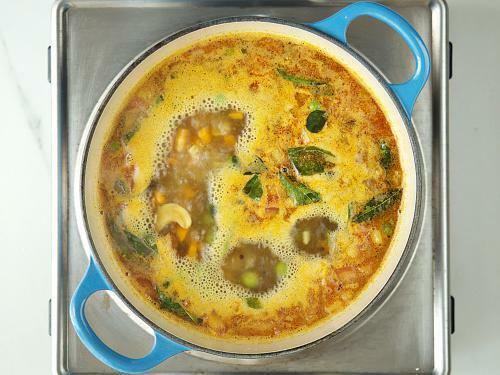 I have also used chana dal. 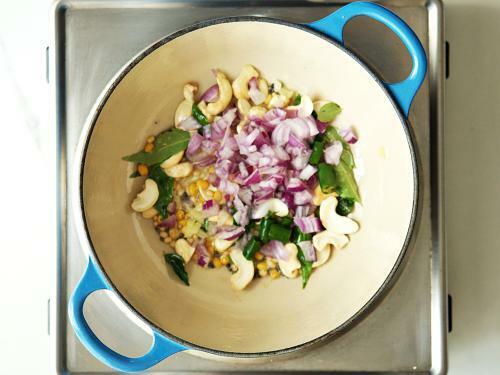 5.Stir and fry all of them until the dal turns golden. Then add in ginger and curry leaves. Fry them for a minute. 6.Add onions and chilies. Fry until transparent. 7. Add in all the veggies and fry for 2 mins. Cover and cook on a low heat until they turn tender. 8. Add salt, turmeric and vangi bath powder. If you do not have it you can just use any other spice powder like sambar powder or pav bhaji masala. 9. Pour water and mix. Check salt and spice. If needed add more salt. 10.When the water comes to a rapid boil, reduce the flame to medium or low. Pour the rava to the water in a slow stream with your left hand. Keep stirring the water with your other hand. Quickly check if there are any lumps & break. 11. Lower the flame completely and cover the pot. 12. Turn off the stove when the water is absorbed. Keep the khara bath covered for another 5 mins. 13. 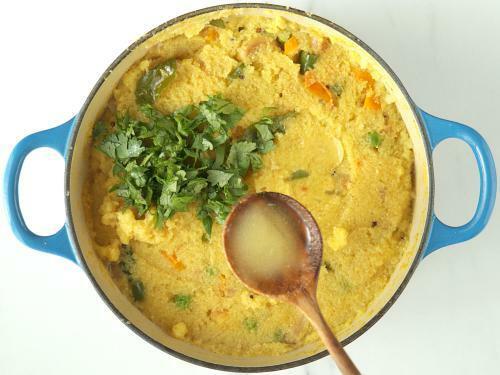 Add chopped coriander leaves and half tbsp ghee. Mix well. 14. Squeeze in some lemon juice. 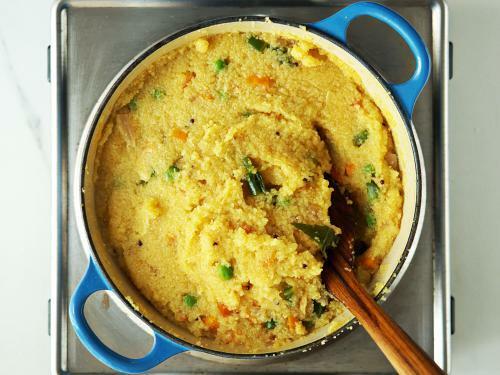 Serve khara bath with coconut chutney. Very good work. Love this blog and the recipes. I don’t cook often but Will surely be trying a few. Thank you so much. Sure do try! yes sure. I just need some time. Thanks for the khara Bhath. Came out awesome. Can you show more snacks healthy pls? you are welcome. Thanks for trying. I will try.